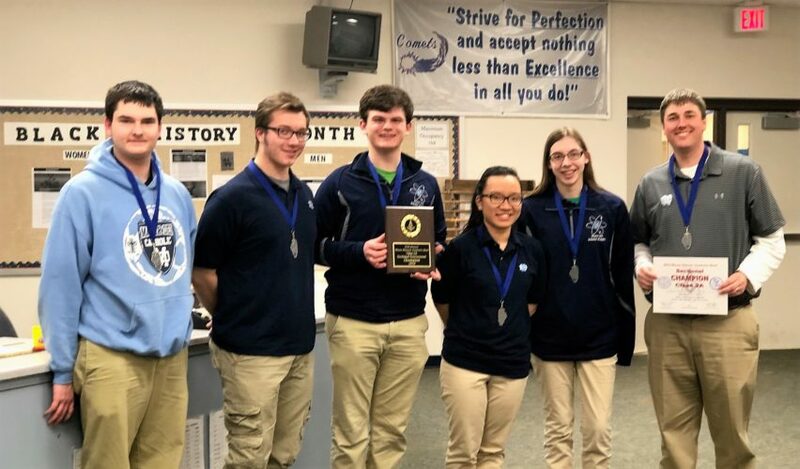 Congratulations to the Scholar Knights for winning the 35th Annual Masonic Academic Bowl Tournament held at Greenville High School Saturday, February 17! Mater Dei faced five foes in pool play, with the top two teams in each pool advancing to the single elimination championship tournament. The Knights defeated Nashville 370-160, Gibault 300-230, Columbia 320-150, Carlyle 350-150, and Hillsboro 340-200. By virtue of their 5-0 pool play record, Mater Dei snatched a top seed heading into the afternoon championship tournament. In the semifinal, the Knights faced Wesclin, who they defeated in 2017 to win the Masonic Sectional. After twenty-one questions, the score was tied 140-140, but Mater Dei took and kept the lead at question twenty-two, winning 230-180. In the championship, the Knights faced Greenville, who defeated them in December to win the South Central Scholastic League Tournament crown. Determined not to let history repeat itself, Mater Dei built a 100-point lead after thirteen questions, never looked back, and won the championship 310-130. Ben Logullo led the Scholar Knights with 34 toss ups, followed by John Hund (19), Mai Khuc (18 times), Anna Klostermann (5), and Dakota Hemker (2). The wins improve the Knights’ record to 59-10 on the season. The Scholar Knights also earned a berth to the Masonic State Championship on March 3 in Bloomington. Pictured after winning the Masonic Academic Bowl Tournament are Scholar Bowl members (from left) Dakota Hemker, John Hund, Ben Logullo, Mai Khuc, Anna Klostermann, and Scholar Bowl moderator Mr. Scott Timmermann.